Unusual in that it flowers directly from the trunk and primary branches, a botanical process known as cauliflory, and pollinated by tiny midge flies, the small cacao tree produces pods containing both a mucilaginous pulp – seen as highly delicious by monkeys, rats, bats and squirrels  – with the hard bitter seeds (30-50 seeds on average per pod in cultivated cacao, less on wild trees) that are the source for chocolate, although they are generally not desirable to the animals gnawing through the pods. Because the pods do not easily drop on their own, cacao was originally dependent on these animals to distribute the seeds and widen its earliest habitats,  gradually spread by humans from the Amazon of Peru and Brazil to Columbia northward to Central America as domestication widened. Evidence for cacao use by Mesoamerican peoples suggest it was first popularized about 1900 BCE along the Pacific coast of Chiapas by the pre-Olmec Mokaya culture – seen at the site of Poso de la Amada and scientifically verified by mass spectrometry  – and subsequently in the Olmec culture about 1750 BCE along the coast of the Gulf of Mexico, although these appear to be initially fermented beverages rather than chocolate as we know it. 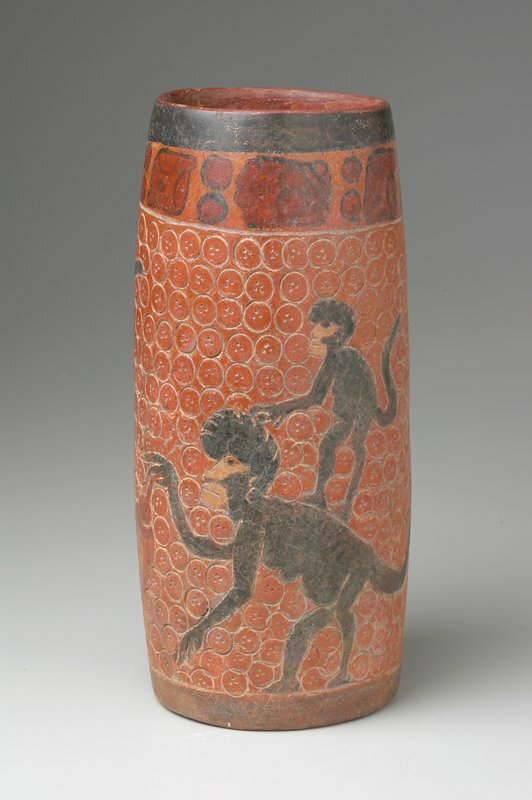 How important cacao was and how it became integrated into Mesoamerican social ritual is demonstrated by several lines of evidence, including archaeological artifacts in the form of ceramic illustration. Chocolate was connected to both marriage celebration and funerary rites and was seen as a vital component of civil functions, especially among elite members of society. 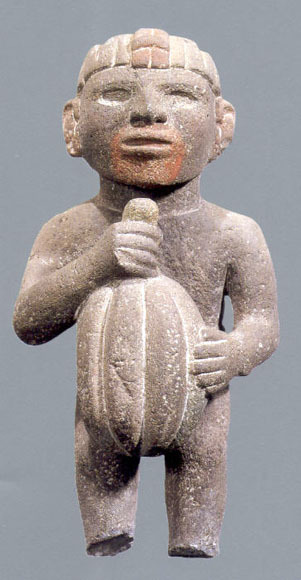 After the Olmec, Teotihuacan developed the long distance cacao trade, mostly derived from moist tropical jungle regions like Veracruz, Tabasco and Pacific Coast Guatemala. 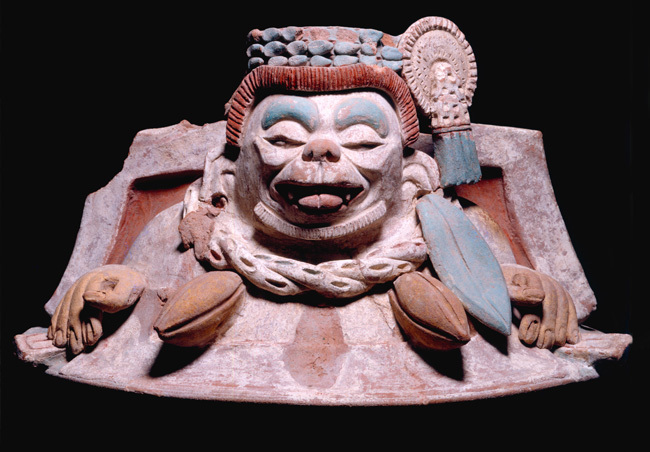 Although some yet undeciphered literary accounts remain highly debated, Maya culture following in the Classic Period (200-900 CE) apparently had a Cacao god or goddess, Ek Chuah, who had an April festival. 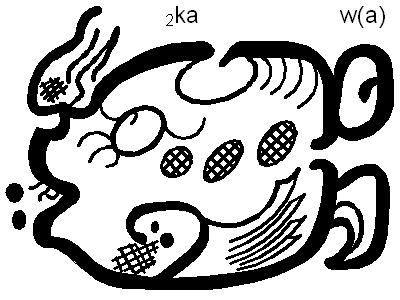 According to some Maya myths, Plumed Serpent – Cucumatz in the Quiché (Ki’che’) Popol Vuh, often identified with Kukulkan of the Yucatec Maya – gave cacao from a mountain (sometimes called “bitter water place” a name possibly referencing cacao) after the creation of humans from maize and water. The first Hunahpu’ (the mythical “Blowgunner”), father of the Heavenly Twins, is also associated with this divine gifting event. Maya archaeology has been more successful. The site of Rio Azul ca. 460 CE has produced several evidences for cacao ranging from ceramic residue analyses, finding theobromine traces inside vessels,  to external painting on vessels that show seated Maya lords with heated chocolate as a liquid. Cacao beans have also been found at the Peten Maya site Uaxactún (floruit 500-900 CE). Topping the brew, a thick head of chocolate foam (whipped) was particularly valuable to Maya consumers. Chocolate was perceived as having medicinal value to ancient Mesoamerica, either by itself or as a carrier for other therapeutic substances. Chocolate was so valuable from cacao as a “cash crop” in Mesoamerican cultural history that it often served as a form of currency – the Codex Mendoza indicates that cacao was the primary tribute paid by some jungle regions of the Aztec Empire. During the height of Aztec empire in the 15th century, annual tribute from the cacao groves of almost 800,000 cacao beans (a xiquipl load was 8,000 beans, and nearly 1000 xiquipl were delivered) to great markets like Tlatelolco (described by Bernal Diaz) at Tenochtitlan and other major cities by long distance merchants called pochteca who were most often appointed and regulated by the Aztec nobility and ruler , although this quantity may not be an annually representative volume. At times around 90 high quality cacao beans could be exchanged to purchase a new cotton mantle for Aztecs. Weighing the old indigenous myths against modern clinical science, somewhat in keeping with ancient myths of its valued potency, theobromine (the cacao alkaloid C7H8N4O2) has several tested physiological effects, not the least of which are vasodilator (blood vessel widener), myocardial heart stimulant – but reducing blood pressure – and as a diuretic aiding urination, as well as a treatment for asthma and coughing and arteriosclerosis, with some debated suggestions of treating degenerative angina or even anticarcinogenic therapies. That theobromine can be seen as addictive and lead to sleeplessness is also often accepted in medical literature, although the amounts causing these effects differ depending on body mass. If even a few of these possible positive effects are true, it is no wonder that cacao has such a global legacy beyond Mesoamerica. An anecdote about Christopher Columbus is apropos: in 1502, a captured canoe at Guanaja off Honduras yielded a quantity of mysterious “dried almonds” that when spilled in the boat bottom, the native Americans dived for like precious gold, “they scrambled for them as though they were eyes that had fallen out of their heads.”  Although he did not know it, the mystified Columbus had encountered cacao, the “food of the gods”. John S. Henderson, Rosemary A. Joyce, Gretchen R. Hall, W. Jeffrey Hurst and Patrick E. McGovern. “Chemical and archaeological evidence for the earliest cacao beverages.” Proceedings of the National Academy of Science 104 (2007) 18937-40. Michael D. Coe. “El chocolate en la cultura guatemalteca.” Address at the Archaeological Conference on Chocolate. Universidad Francisco Marroquin. February 24 2005, note therein “El árbol de cacao: Theobroma cacao”; co-author with his wife Sophie D. Coe [deceased] of The True History of Chocolate, Thames and Hudson, 2007 ed. ; also see Cameron McNeil, ed. Chocolate in Mesoamerica: A Cultural History of Cacao. Gainesville: University Press of Florida, 2006. Allen M. Young. The Chocolate Tree: A Natural History of Cacao. University Press of Florida, 2007 rev. ed, xi. Terry G. Powis, W. Jeffrey Hurst, Maria del Carmen Rodriguez, Ortiz C. Ponciano, Michael Blake, David Cheetham, Michael Coe, John G. Hodgson. “Oldest chocolate in the world.” Antiquity 81.314 (2007). also valued for feasting and social exchange, cf. Christopher Pool. Olmec Archaeology and Early Mesoamerica. Cambridge University Press, 2007, 140. Richard F. Townsend. The Aztecs. Thames and Hudson, 1993 ed., 173. Bijal Trivedi. “Ancient Chocolate Found in in Maya Teapot.” National Geographic News, July 17, 2002, using liquid chromatography. Blake Edgar. “The Power of Chocolate”. Archaeology 63.6 (2010). David Wolfe, Sharon Holdstock. Naked Chocolate: The Astonishing Truth About the World’s Greatest Food. Berkeley: North Atlantic Books (Society for the Study of Native Arts and Sciences), 2005, 18. Jeremy Sabloff. The Cities of Ancient Mexico. Thames and Hudson, 1990 ed., 24, 59 (regarding Teotihuacan cacao marketa), 67 (regarding Kaminaljuyu on the cacao trade route), 104 (long distance cacao trade). Caleb J. Kelly. “Effects of theobromine should be considered in future studies. American Journal of Clinical Nutrition 82.2 (2005) 486-8. M. Rosenblum. Chocolate: A Bittersweet Saga of Dark and Light. New York: North Point Press / Farrar, Straus and Giroux, 2005, 3. 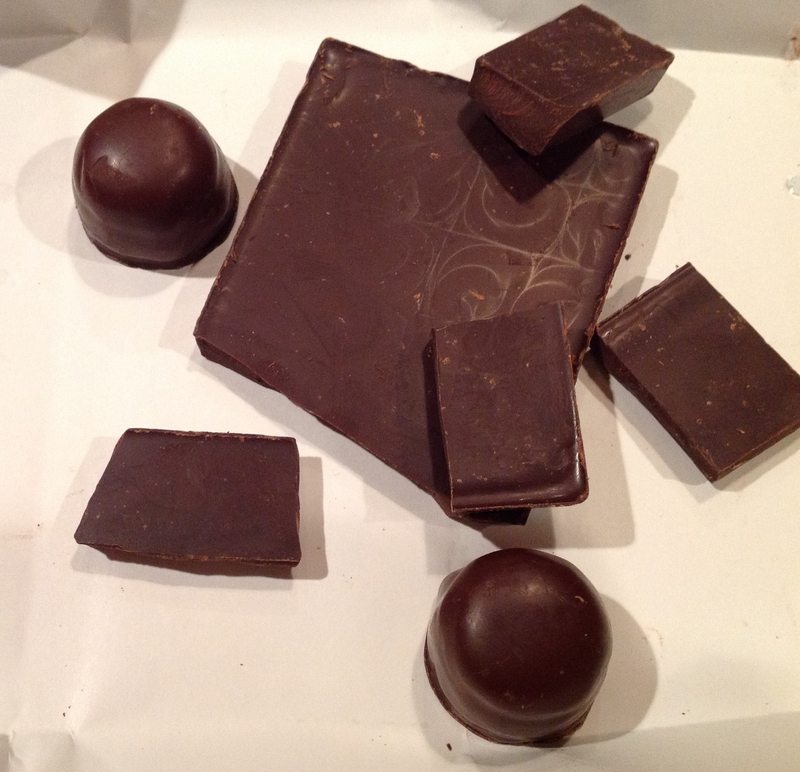 The author (also a Research Associate in Archeothnobotany at the Institute for EthnoMedicine) notes that a quantity of dark chocolate was consumed to better enable the research and writing of this article.